really is solid on his contacts. I am so thrilled with how he is running! always work to do and I am loving the work even more than I love the trials. He is that much fun to work with. but I am working on my timing, and he responded as though he'd been doing this forever. Such a boy! didn't even have sniffles. My only complaint is that the run was too darn short because i was having so much fun! Photos and video coming soon! settle down a bit before runs. I hope you enjoy watching him. 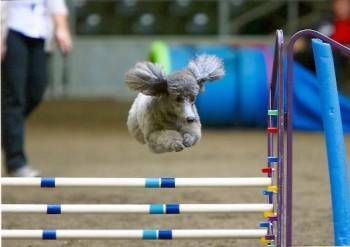 Razz Runs, jumps and weaves! Still need one more std leg for our excellent title. Did a rally trial a couple of weeks ago. First time in advance rally, and he was a star having a score of 98 and first place. First time off leash. Also got our novice fast title last weekend. Very proud of him. 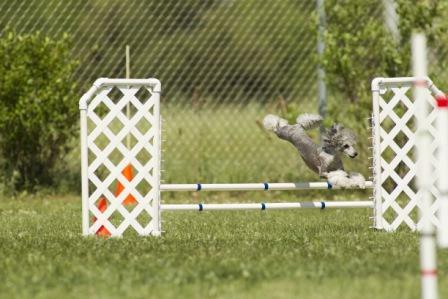 Right now in agility we have been having moments of brilliance and a couple of errors on the courses. Still learning how to run him. All in all I am very pleased with him. He is always up for anything. Even in this cold weather, he wants to play ball and run around in the snow. Well let's hope for an early spring! Here's a few photos I took of Janie. We're training on agility and obedience and have started doing some nose work classes. 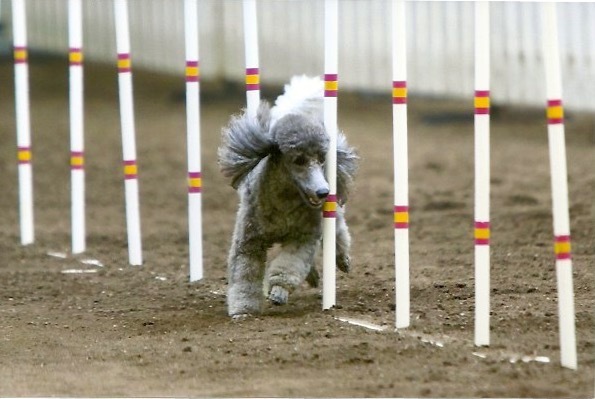 Although she knows how to do all the obstacles in agility, we're still working on foundation skills and teamwork. She loves playing agility with me and we have a lot of fun, but she's still easily distracted with other dogs, anything else that moves and her environment in general. I have meant to write you an update for months now. Time always gets away. But all is well here. Quirk continues as amazing as ever in agility. He is such a complex little guy and he continues to keep me on my toes. I have found ways to work with his overexcitement at all the many things in the world that excite him. But he is such a smart boy and learns so fast. He is truly a joy to work with. 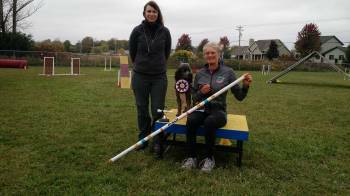 He is really a talented boy and he is amazingly bidable doing agility. I have worked very hard, and keep on working, to handle in ways that get him information faster and faster. We are going to Nationals next March in Reno. I am not sure about that, especially because they are almost the same weekend as PCA, which Gail told me was amazing. And i would love to go with Quirk next year. 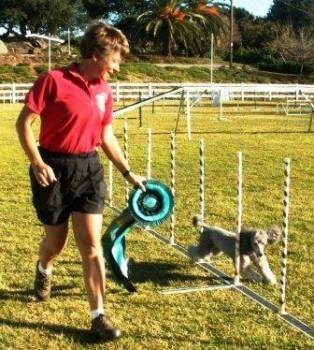 Next to doing agility, which is as much my love as his, i have a great companion in Quirk. As does Pan. The three of us are together almost all the time. My husband adores Quirk and when he is not traveling, spoils him rotten, wrestling, chasing, all the fun things Quirk loves to do. He is such a sweet little love at times, though he still has his moods, but i work with those. 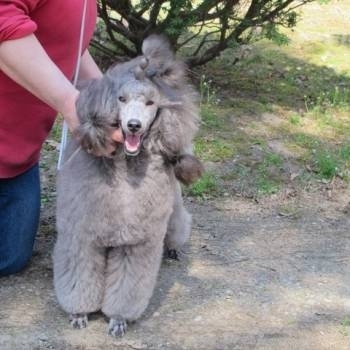 I did decide to have him groomed by someone else. 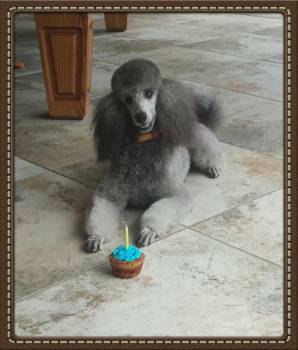 He just never got used to it and i am not an experienced enough or a fast enough groomer to make it a reasonable experience for him. And i was not at all wanting to hurt our relationship. So, i found someone who is good and very patient with dogs who don't like the process at all. Though, we have found a way so that i can brush him every couple of days and do a little shaving of his face in between being groomed. But the hard stuff, i leave to the woman who grooms him. I will send along a few videos. I am consistently doing all the regulars classes and Premiere classes. The foundation work we did was such that all the international kinds of courses are something we negotiate pretty well. He really is just amazing. 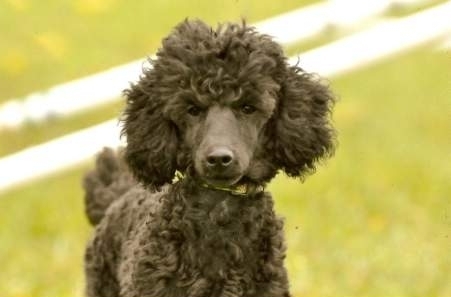 And, (sorry to brag), this little 12 pound poodle very often has the fastest times of all dogs, all heights. 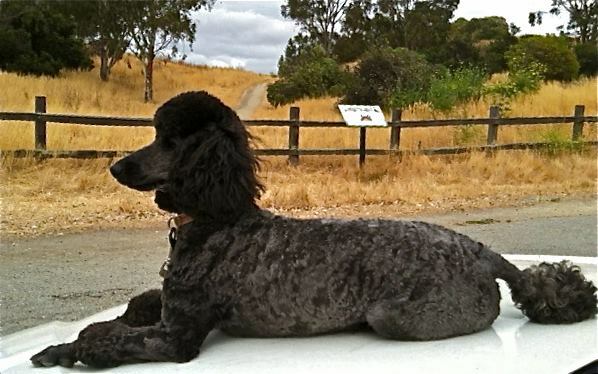 I will send you one video where his JWW tine was 20 seconds and change and all the 20" dogs were getting themselves psyched "to beat the poodle", and not let the silver bullet be faster than their border collies and aussies! All in good fun, but it was pretty funny. And none of them came close. We were still faster by 1/2 second than the next fastest. 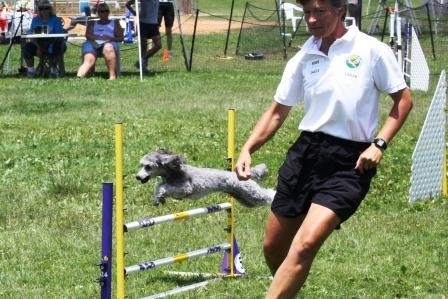 I am on the seminar committee of one of the agility clubs i belong to. I am so excited because I suggested that we ask Cassie Schmidt to be one of our presenters. And she can come! Unfortunately, i have to wait several months, but it will be great. And I am hoping she goes to Nationals this next year in Reno with Bliss and True. I hope all is well with both of you. I will try to keep you updated on the Quirkster!